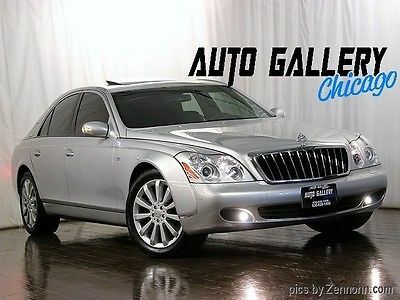 Photo Viewer 2009 Maybach 62 w/Partition Vital Information Year Make Model Mileage Engine 2009 Maybach 62 w/Partition 33,596 5.5L V12 Engine Exterior Interior Stock# VIN White White B2579 WDBVG78J09A002697 view window sticker Carfax Highlights View Carfax Report Not all accidents or other issues are reported to CARFAX. The number of owners is estimated. See the full CARFAX Report for additional information and glossary of terms. Carfax Highlights No Accidents / Damage Reported to CARFAXNo Airbag Deployment Reported to CARFAXVehicle Qualifies for the CARFAX Buyback GuaranteeNo Structural/Frame Damage Reported to CARFAXNo Manufacturer Recalls Reported to CARFAXNo Indication of an Odometer Rollback2 OwnersNo Total Loss Reported to CARFAX Vehicle Video Photos Description 2009 Maybach 62 w/Partition 2009 Maybach 62 w/Partition Wall Divider This is a 2009 Maybach 62 with a factory Partition which makes this car ultra RARE and HIGHLY DESIRABLE. 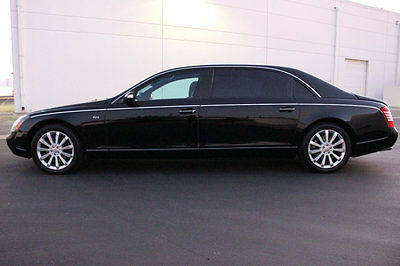 This Maybach was custom ordered in a impossible to find White exterior as well as a White interior color combination. 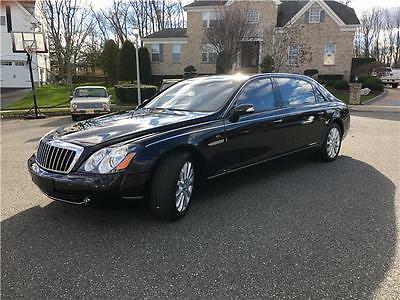 It also has 20" Maybach Zeppelin Chrome wheels with NEW tires all around which makes this Maybach stand apart from any other one out there . This car looks NEW inside and out. 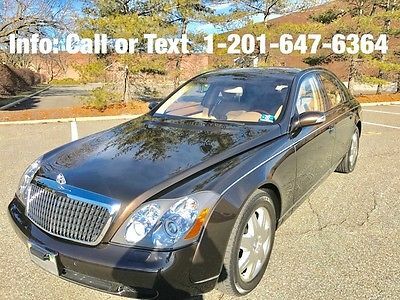 Call before you miss out on this once in a lifetime opportunity at owning this impossible to find Maybach as they are no longer in production. Thank you for viewing our listing. For more information feel free to call us 949-791-2167. Thank you. Optional Equipment HEADLINER IN DIFFERENT COLOR ALCANTARA[___]Cost: $2500.00CURTAINS IN REAR WINDOW IN DIFFERENT COLOR[___]Cost: $420.00 DASHBOARD & DOOR COVERS IN GRAND NAPPA LEATHER[___]Cost: $4800.003-PLACE REAR SEATINGCost: $12250.00HIMALAYAS DARK GREY DOOR CENTER SECTIONS IN GRAND NAPPA LEATHER[___]Cost: $2880.00PARTITION WALL BETWEEN FRONTCost: $30250.00 Standard Equipment ENTERTAINMENT Bluetooth adapter for rear cabin mobile phone-inc: choice of approved phone Bose Everywhere 21-speaker Dolby surround sound system, Bose AudioPilot digital processor w/MP3 capability Lifetime Sirius satellite radio subscription EXTERIOR Infrared-reflective glass w/laminated front, rear, side glass 19" x 8.0" hollow spoke alloy wheels Passenger-side exterior mirror parking assist (programmable to tilt down when shifting into reverse) Single rear foglamp Dual aero-blade rain-sensing windshield wipers w/soft-reverse, heated windshield washer system Touch turn signals flash three times w/one touch of turn signal lever Pneumatic door closing assist Dual pwr mirrors w/automatic heating, pwr fold-in, memory, driver-side auto-dimming & integrated turn signal indicators Halogen reverse lamp Monocoque body structure w/41% high-strength/low-alloy steel Pwr sunroof above front cabin w/tilt/sliding, tinted glass, express- open/close, memory 275/50R19 tires Automatic lamp substitution activates a nearby lamp if a critical lamp or circuit fails Bi-xenon High Intensity Discharge (HID) headlamps w/automatic level control, light-sensing auto-on headlamps, halogen auxiliary highbeams, halogen front foglamps w/heated high pressure washers INTERIOR 4-way sun sensor directs air flow to mitigate effects of excessively high or low exterior temperatures (2) sets of rear seat headphones Front/rear occupant-activated massage seatbacks Wood trim on dash, upper doors, consoles, lower doors, shift gate, overhead control units, rear cabin overhead instrument binnacle Nubuck leather trim on central door & lower instrument panel Seatbelt sensor allows priority climate control of occupied seating Lighting-inc: dual front map lights, rear cabin environmental comfort lighting, dual rear reading lamps located in side panels, (3) upward directed lamps on each B & C pillar, entrance lamps in all doors & beneath outside mirrors Rear center console w/storage, 12-volt pwr outlet, dual cup holders Rear center console refrigerator (Option will automatically be selected for all orders. Please call Maybach Assistance Center to delete this option) Grand Nappa leather on dash, console, doors, armrests & rear shelf Dual rear cabin illuminated vanity mirrors Dual retractable cup holders in center instrument panel Pwr door locks w/drive away locking (3) button garage door control Quad-zone automatic climate control w/individual controls for automatic/manual settings, electronically adjustable vents, humidity sensor, rest mode, tunnel mode 4-spoke leather & wood trimmed heated steering wheel-inc: tilt/telescopic steering column, illuminated audio/phone controls, easy exit feature Diecast magnesium lockable soft opening glovebox w/illumination Center console multifunction display-inc: trip computer, Flexible Service System, oil level, digital speedometer, radio/CD status, phone book, DVD based navigation system, reminder/malfunction messages, programmable settings, Distronic settings, phone status, tire pressure monitoring system Filters-inc: electrostatic dust/pollen, active charcoal w/smog-sensor Auto-dimming rearview mirror w/memory Tele Aid GPS w/collision/alarm notification, stolen vehicle tracking, remote keyless unlocking service, concierge service SmartKey memory feature-inc: driver seat, steering column position, climate control settings (up to (3) users per car) Night security illumination w/programmable duration Integrated mobile phone in front cabin-inc: instrument panel & audio system display, steering wheel controls, Multi-Handset Interface (MHI) cradle, external antenna, microphone for hands-free communication In-car voice control system for driver-operation of commonly used phone & audio system features Front/rear pneumatically adjustable seatback support chambers-inc: (3) in lumbar, (1) in shoulder area, (1) in each side bolster SmartKey w/integrated Keyless Go remote control-inc: panic alarm, central locking, sunroof, trunk/windows opening/closing, fuel filler door (Option will automatically be selected for all orders. Please call Maybach Assistance Center to delete this option) Pwr heated front bucket seats w/automatic head restraint height adjustment, lumbar support, 5-position memory Auto illumination of displays & controls based on ambient light Electronic trunk closer (fully opens & closes lid via controls on driver door, trunk lid or SmartKey) Removable rear seat head restraints w/adjustable side wings & Alcantara headrest pillows Dual front illuminated vanity visor mirrors w/magnifying & standard lenses Rear cabin instrument cluster-inc: clock, speedometer, outside temp (2) Robbe & Berking sterling silver champagne flutes & champagne flute insert COMAND cockpit management data system integrates navigation, AM/FM/weatherband/satellite radio, in-dash CD player, controls for CD changer, rear cabin audio-visual system, rear view parking camera w/ParkAssist & 6.5" color LCD in-dash screen Pwr rear window curtains Grand Nappa front/rear leather seating surfaces & head restraints Individual heated rear seats-inc: pwr adjustment of seatback recline, seat cushion angle & length, head restraint height/angle adjustment, pwr telescoping & pivoting lower-seg support w/pivoting footrest, 3-position memory Rear cabin audiovisual system w/DVD player, single-feed 6-disc CD changer, aux inputs & remote control, dual 9.5-inch video monitors, one on rear face of each front seat Pwr windows w/one touch express-up/down Rear cabin beverage holder for either one large bottle & two pieces of stemware or two cupholders (2) Rear retractable 4-way adjustable folding tables w/wood/chrome/leather trim Instrumentation-inc: analog speedometer, tachometer, coolant temp, outside temp, Touch Shift gear selection display, sport/comfort shift mode display Velour floor carpeting & floor mats Electrically heated rear window w/automatic shutoff Anti-theft alarm system w/tow away protection Alcantara pillars, sun visors, headliner One trunk mounted handcrafted Dunhill Collection rain umbrella w/sunshade extension Distronic adaptive cruise control w/digital display (Option will automatically be selected for all orders. Please call Maybach Assistance Center to delete this option) Rear center console controls-inc: central locking, interior lamp dimming, rear window curtains, Tele Aid SOS button Engine immobilizer MECHANICAL Rear wheel drive Electrohydraulic 8-circuit braking system w/dual electrohydraulic control units, predictive brake priming, automatic brake-pad drying, adaptive brake pedal Independent rear 5-arm multi-sink suspension Airmatic dual control air suspension w/4-wheel level control Recirculating-ball steering w/speed-sensitive pwr assist Independent front double wishbone suspension 5.5L V12 engine w/twin liquid-to-air intercooled turbochargers Driver-adaptive 5-speed automatic transmission w/touch shift control, standard & comfort modes Electronically controlled Adaptive Damping System (ADS II) inc: dual driver-selectable sport modes Battery trickle charger SAFETY Driver & front passenger airbags w/dual deployment levels based on impact severity, front passenger occupancy sensor Electronic stability control Seat-mounted side-impact airbags on all seating positions 4-wheel anti-sock braking system (ABS) 3-point front/rear seat belts w/Emergency Tensioning Device (ETD), belt force limiter, automatic comfort fit Parktronic audio parking assistant 4-wheel ventilated disc brakes w/emergency-sensing brake assist Curtain airbags Rollover sensor Rear seat tether anchors (LATCH) BabySmart system (deactivates front passenger airbag when BabySmart-compatible child seat is installed) Programmable daytime running lamps Rear door child locks Front/rear crumple zones Illuminated emergency trunk release handle Secure Online Credit Application Applying for a vehicle loan online is one of the quickest and easiest application methods. Our secure online application form is easy to complete, all you need are a few personal and employment details. Get started now. Shipping PRIVATE COLLECTION MOTORS INC proudly recommends Earth Auto Shippers for your vehicle transport. Earth Auto Shippers is a fully licensed vehicle shipping company. Earth Auto Shippers offers "door-to-door" low-cost shipping services using enclosed and open trailers. View more info » At Private Collection Motors Inc, we specialize in the Wholesale division of the EXOTIC and LUXURY Automobile Market and mainly Wholesale-Trade amongst majority of the premier Retail Luxury Automobile dealers within the United States and a few in the Far East. In the 1st quarter of 2011 we decided to add a RETAIL SHOWROOM to our Wholesale Business Model. In the Wholesale World the key ingredient to success is volume of sales and obviously much less profit margin. With years of Experience in the business, we take pride and will keep our promise to provide you with the best value, by hand picking each and every vehicle we provide for sale. Please Contact us for a free copy of the Car Fax Report, additional pictures or if you have any other questions. OUR RETAIL SHOWROOM HOURS ARE MONDAY-FRIDAY 10AM-7PM (PST) SATURDAY & SUNDAY 10AM-6PM. Due to our quick turnover, please contact us to check the availability of any vehicle by phone at 949-791-2167. You can also reach us by email atprivatecollectionmotorsinc@gmail.com. As a part of our services to our customers, we will accept vehiclet rades, provide competative financing and creative leasing, can assist with the transport of any vehicle from our inventory to a nearby Factory Authorized Service Facility for a Pre Purchase Inspection and assist you with enclosed shipping to any destination in the world. We offer EXTENDED WARRANTY, CREATIVE LONG TERM FINANCING and LEASING for transactions within the United States on selected vehicles and credit criteria. We understand that purchase of any Exotic or Luxury type of vehicle highlights a celebrated achievement in one's life; it is our goal as a team to make that experience a positive and memorable one for all of our customers. On that note, we are looking forward to doing business with you and to establish a relationship. Ad created by eCarList.com. Call 214-722-8200 to find out how eCarList can service your dealership. 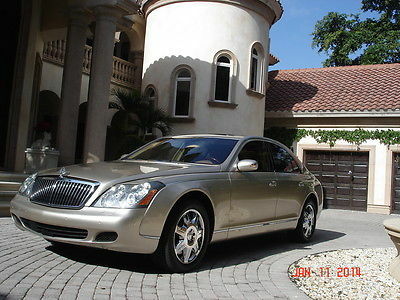 ONE OWNER, Maybach 57 Year 2004 engine V12 Twin Turbo Exterior color Rocky Mountains Brown, Interior Tan leather, Immaculate condition Low Mileage 24,242 this vehicle was only driven in summer time in New Jersey stored in climate controlled garage vehicle is registered to the Company name and was driven by our company founder, very well maintained at Manhattan Maybach and Maybach of Edison NJ, New all 4 tires under 500 miles, also a wheel alignment was performed New Front Battery, and always Batteries plugged to Tender chargers front and rear to keep them 100% charged we have all the books from Maybach issued to the owner and original price stickerWanna see this Gorgeous Maybach Brown one tone color stop by to our office please be sure to call or text and coordinate with Gilio570 Commerce Boulevard, Carlstadt New Jersey.. PRICE IS NEGOTIABLE OR BEST OFFER. 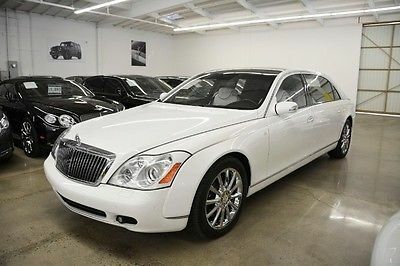 4128 Lincoln Blvd Marina Del Rey, CA 90292 310-827-8665 2009 Maybach 57 Vehicle Information: Mileage: 35,969 VIN: WDBVF78J69A002528 Engine: 12 Cylinders Transmission: Automatic Drivetrain: RWD Exterior Color: Cote D Azur Interior Color: Maldives Blue Stock #: 8942 Location: CA Contact Information: Chequered Flag International Inc. 4128 Lincoln Blvd Marina Del Rey, CA 90292 310-827-8665 Vehicle Description: Chequered Flag International is pleased to offer this 2009 Maybach 57 in Cote D'Azur Blue with Maldives Blue Leather. 35,969 miles with clean Carfax. 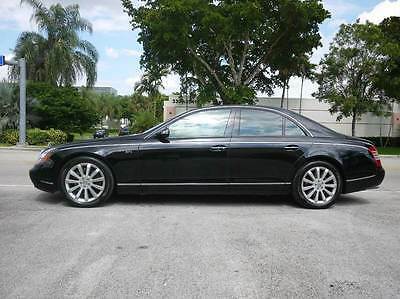 This highly optioned Maybach is as luxurious as they come. Factory options include: Rear-side Retractable Curtains, Heated and Active Ventilated Front Seats, Active Ventilated Rear Seats, Retractable Folding Rear Tables, Solar Module with Solar Power Cabin Ventilation, Factory Custom Options, etc. Total option list adding $20,000 and bringing the original MRSP to $382,080. The paint and body are excellent with no scratches or dings. Interior leather is soft and supple with no rips, or tears. 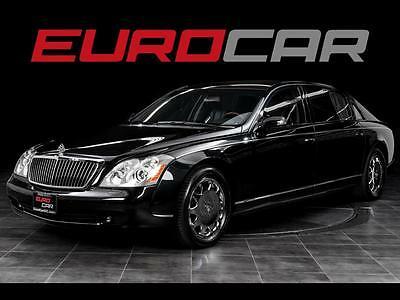 Serviced regularly with a recent mechanical service performed at the Maybach factory authorized repair facility in Palm Springs in September 2016 @ 34,340 miles at a cost of $8,546. Comes with two sets of keys, headsets for rear TV's, remote, trickle charger, etc. Trying to get the books. This is a very good example with no real signs of wear. Inspections encouraged. All sales AS-IS. Sales tax and license fees due if delivered in California. Options: Air Conditioned SeatsAir ConditioningAlarm SystemAlloy WheelsAM/FMAnti-Lock BrakesAutomatic Climate ControlAutomatic HeadlightsAutomatic Load-LevelingBack Up SonarBackup CameraBluetoothCDCD ChangerCruise ControlDaytime Running LightsDriver Airbag Driver Multi-Adjustable Power SeatElectronic Parking AidExtra KeysFog LightsFront Air DamFront Power Lumbar SupportFront Power Memory SeatFront Side AirbagFull Size Spare TireHeated Exterior MirrorHeated SeatsHeated Steering WheelHigh Intensity Discharge HeadlightsInterval WipersKeyless EntryLeather SeatsLeather Steering Wheel NavigationPassenger AirbagPassenger Multi-Adjustable Power SeatPower BrakesPower LocksPower MirrorsPower Rear ShadePower SeatsPower SteeringPower Trunk LidPower WindowsQuad SeatsRain Sensing WipersRear DefrosterSecond Row Heated SeatSecond Row Multi-Adjustable Power SeatSecond Row Side Airbag Second Row Sound ControlsSeparate Driver/Front Passenger Climate ControlsSide Head Curtain AirbagSteering Wheel Mounted ControlsSun RoofTachometerTelescopic Steering ColumnTilt WheelTire Pressure MonitorTraction ControlTrip ComputerTrunk Anti-Trap DeviceTV/DVDVehicle Stability Control SystemVoice Activated TelephoneWoodgrain Payment Information: We accept cash, cashiers-check, and certified funds.Successful "winning" bidder must contact us within 24 hours after the auction has ended to verify purchase and make arrangements to complete the transaction. Within (5) business days of the end of auction, full payment must be received either by cash payment, cashiers-check, or certified funds. If funds are not received, and an alternate arrangement has not been made, the vehicle can and will be made available to other potential buyers on a first-come, first-serve basis. Shipping Information: Please understand that it is the Buyers responsibility to arrange shipping. We are NOT the shipping company. All shipping questions and/or concerns should be addressed directly with the shipping company used to transport said vehicle. Should you need assistance in locating a shipping service, please let us know! We aim to recommend only quality vendors. Terms & Conditions: All vehicles are sold "as-is" and without warranty. Some vehicles will have factory warranty remaining (will be stated in our description). Online Bidders are entering into a legal and binding contract to purchase the vehicle described above. If you do not intend to purchase this item, please DO NOT BID! We reserve the right to cancel bids and/or our auction at anytime for any reason. 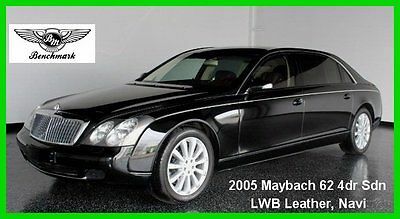 2006 Maybach 57S S Maybach 57S BLACK with 37,870 Miles, for sale! Brandon Bailey (512) 317-5000 3101 Gulf Freeway Dickinson Texas 77539 ? ? ? ? 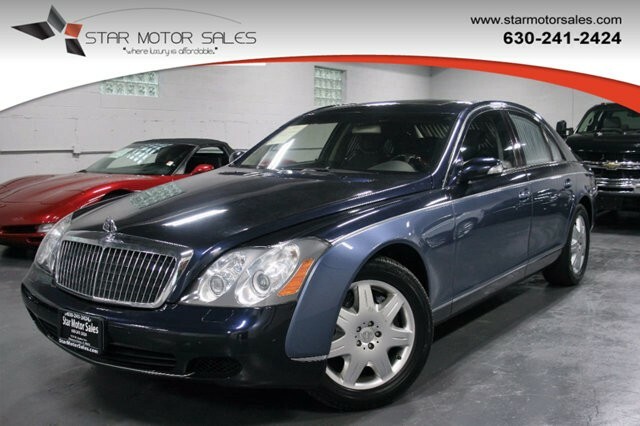 2005 Maybach 62 Vehicle Information VIN: WDBVG78J55A001121 Stock: 001121 Mileage: 44,795 Color: Custom Exterior Color Trans: Automatic Engine: 5.5L Turbocharged MPG: 12 City / 17 Highway Drivetrain: Rear Wheel Drive ? ? ? ? 1 of 30 ? View Large Images ? ? Description fully reclining rear seats, Maybach four-zone climate control, tinted windows, infrared-reflecting laminated glass all round, AirMATIC dual-control air suspension, display instruments in rear roof liner (showing speed, time, and outside temperature), folding rear tables (left and right), BOSE Surround Everywhere sound system, and a refrigerator compartment. Cockpit Management and Navigation System (COMAND), which includes DVD navigation, CD changer in rear seats, DVD players and TV tuners front and rear, two rear LCD TV screens including remote control and two sets of headphones, and automatic closing doors and panoramic glass sunroof. ?Credit Application ?Directions to Dealer ?Contact Us Options and Standard Features Options Heated Steering Wheel 12 Cylinder Engine 4-Wheel Disc Brakes 5-Speed A/T A/C A/T Abs Active Suspension Adjustable Steering Wheel Air Suspension Aluminum Wheels Am/Fm Stereo Auto-Dimming Rearview Mirror Automatic Headlights Brake Assist Cd Changer Cd Player Climate Control Cruise Control Daytime Running Lights Driver Air Bag Driver Illuminated Vanity Mirror Driver Vanity Mirror Emergency Trunk Release Engine Immobilizer Entertainment System Floor Mats Fog Lamps Front Reading Lamps Front Side Air Bag Gasoline Fuel Heated Front Seat Heated Mirrors Heated Rear Seat Hid Headlights Intermittent Wipers Keyless Entry Keyless Start Leather Seats Leather Steering Wheel Mirror Memory Multi-Zone A/C Navigation System Passenger Air Bag Passenger Air Bag Sensor Passenger Illuminated Visor Mirror Passenger Vanity Mirror Power Door Locks Power Driver Seat Power Folding Mirrors Power Mirror Power Outlet Power Passenger Seat Power Steering Power Windows Premium Sound System Rain Sensing Wipers Rear A/C Rear Defrost Rear Parking Aid Rear Reading Lamps Rear Side Air Bag Rear Wheel Drive Remote Trunk Release Seat Memory Seat-Massage Security System Steering Wheel Audio Controls Sun/Moon Roof Sun/Moonroof Telematics Telephone Tire Pressure Monitor Tires - Front Performance Tires - Rear Performance Transmission With Dual Shift Mode Trip Computer Turbocharged Universal Garage Door Opener Variable Speed Intermittent Wipers Basic Information Stock Number: 001121 VIN Number: WDBVG78J55A001121 Style Name: Sedan Make: Maybach Model: 62 Model Year: 2005 Vehicle Type: Exotic Vehicle Trim: 4Dr Sdn LWB Leather, Navi Interior Color: Barrier Reef Red Leather Exterior Color: Caspian Black - Black Body Type: Sedan Engine Compressor: Twin Turbo MPG Automatic City: 12 MPG Automatic Highway: 17 Engine Description: 5.5L Turbocharged Fuel Type: Gas Fuel Induction: Sequential MPI Valves Per Cylinder: 3 Aspiration: Twin-Turbocharged DriveTrain Driven Wheels: Rear-Wheel Transmission: Automatic Wheels Rims: Silver Aluminum Drive Train Type: Rear Wheel Drive Suspension Active Suspension Independent Suspension: Four-Wheel Leveling Suspension: 4-Corner Stabilizer Bar: Front And Rear Instrumentation Clock Compass External Temp Low Fuel Level Tachometer Trip Computer Roof and Glass Front Wipers: Variable Intermittent Privacy Glass: Light Rear Defogger In Car Entertainment Antenna Type: Window Grid Audio System: AM/FM Stereo Rear Audio Speakers: 21 Video: With DVD Seats Drivers: Multi-Level Heating Drivers Height: Power Drivers Lumbar: Massaging Drivers Power: 12 Passenger: Multi-Level Heating Passenger Height: Power Passenger Lumbar: Massaging Passenger Power: 12 Seating Capacity: 4 Front Seat Type: Bucket Upholstery: Leather Center Armrest Heated Lumbar: Massaging Convenience Cargo Nets: Cargo Net Center Console: Full With Covered Storage Cruise Control Cupholders: Front And Rear Door Pockets: Driver, Passenger And Rear Overhead Console: Mini Power Outlets: 2 Remote Trunk Release: Power Steering Adjustment: Tilt And Telescopic Steering Power: Speed-Proportional Power Steering Steering Wheel Control Universal Remote Transmitter Auto Dimming Mirrors: Electrochromatic, Driver Only Power Retractable Mirrors Reverse Tilt Mirror: Passenger Mirror Power Door Locks Windows: Power Windows Navigation System Memory Features Exterior Mirrors Memory Features Number of Drivers: 5 Memory Features Rear View Mirror Memory Features Steering Wheel Comfort Air Conditioning: Automatic Air Filtration: Interior Air Filtration Trunk Lights: Cargo Area Light Center Console Trim: Leather/Genuine Wood Dash Trim: Genuine Wood Door Trim: Genuine Wood Mats: Carpet Front And Rear Reading Lights: Front And Rear Shift Knob: Leather/Genuine Wood Steering Wheel Trim: Leather/Genuine Wood Vanity Mirrors: Dual Illuminated Vanity Mirrors Features Bumpers: Body-Colored Door Reinforcement: Side-Impact Door Beam Safety Turning Circle: 48.6 ABS: 4-Wheel Head Airbags: Curtain 1St And 2Nd Row Anti Theft System Brake Assist: Braking Assist Safety Locks Daytime Running Light Engine Immobilizer Headlights Auto Delay: Auto Delay Off Front Headrests: Power W/Tilt Rear Headrests: 2 Safety Signal Mirrors: Turn Signal In Mirrors Safety Stability Control Driver and Passenger Airbag Side Airbag Stability Control Door Reinforcement: Side-Impact Door Beam Doors Rear Door Type: Trunk Side Door Type: Conventional Dimensions Front Head Room: 38.8 Inches Front Shoulder Room: 62.2 Inches Front Leg Room: 41.3 Inches Rear Head Room: 39.8 Inches Rear Leg Room: 41.0 Inches Rear Shoulder Room: 61.5 Inches Luggage Capacity: 21 Cu.Ft. Length: 242.7 Inches Width: 78.0 Inches Height: 61.9 Inches Wheelbase: 150.7 Inches Max Gross Vehicle Weight: 7,187 Lbs. Curb Weight: 6,129 Lbs. ? Apply Now Secure Credit Application Applying for a vehicle loan online is one of the quickest and easiest application methods. Our secure application is easy to complete, all you need are a few personal and employment details. Contact Benchmark Wholesale 3101 Gulf Freeway Dickinson Texas 77539 View Map Ask for:Brandon Bailey Primary Phone:(512) 317-5000 Contact: ?Contact Us Terms Placing a Bid: Your bid constitutes a legally binding contract to purchase this vehicle. Please do not bid if you're not seriously interested or financially able to purchase this vehicle. Please read eBay's User AgreementBenchmark Wholesale reserves the right to, Obtain and verify the registered information of all users who bid on this auction. Cancel any and all bids at our discretion, or end the auction early if necessary.Bidders Age: You must be 18 years of age or older to Bid. Special eBay Bid Retraction Rules: Please read eBay's "Retracting a Bid" If you place a bid before the last 12-hour period of the auction: You may retract that bid before that last 12-hour period but only for exceptional circumstances. You will not be allowed to retract that bid during the last 12-hour period of the auction. If you place a bid during the last 12-hour period of the auction: You will be allowed to retract the bid for exceptional circumstances but only if you do so within one hour after placing the bid.Funds & Financing: For help in arranging for a Pre-Approved loan or for any questions please e-mail or phone Brandon at(512) 317-5000 prior to bidding. Buyers Inspection: Benchmark Wholesale has done our best to disclose all information known about this vehicle for auction. Benchmark Wholesale welcomes a buyers inspection. If you plan to have a buyers inspection, please make sure you inspect the vehicle prior to the auction ending. Inspection fees if any are Buyers responsibility. Representations and Warranties made by seller: This vehicle is being sold "as is". Manufacturer's warranties may still apply. Extended warranty may be available, e-mail or phone Brandon at (512) 317-5000 for details. No representations or warranties are made by seller, nor are any representations or warranties relied upon by bidders in making bids. Taxes and Registration fees: Out of state buyers are responsible for all state, county, city taxes and fees, as well as title service fees in the state that the vehicle will be registered. All taxes and fees must be paid in full in order for vehicle to be titled and registered. Title Information: Vehicles titles may be held by banks or lenders as collateral for loans. In many cases there is a delay in receiving the original instruments up to 21 days from the time we pay a vehicle off. While we usually have all titles in our possession at closing, there are occasions where we may be waiting for them to arrive. If payment is made by cashier's or personal checks we will hold all titles for 10 days or until funds have cleared. Shipping & Delivery: All shipping charges are buyer's responsibility. Benchmark Wholesale will help with shipping arrangements but will not be responsible in any way for claims arising from shipping damage!Licensed Carriers are generally insured for $3,000,000.00. We assume no responsibility for damages incurred after the vehicle leaves our showroom. All shipping arrangements are provided by Benchmark Wholesale as a courtesy. We are not affiliated with any carrier. Any claims or other communication regarding shipment of vehicles will be between you and the shipper, not with Benchmark Wholesale. The amount of time it takes for delivery is dependent on the carrier, but is generally 7-14 days from the date the vehicle is picked up from our facility until it is delivered to your destination. Verify with the shipper for an Estimate Time of Arrival to be sure. Finalizing your Purchase: Benchmark Wholesale will contact the successful high bidder by e-mail after the auction closes. Successful high bidder MUST communicate with Brandon at Benchmark Wholesale by e-mail or phone(512) 317-5000 within 24 hours of the auction ending to make arrangements to complete their transaction. If we cannot confirm your intention to buy or the sale is not completed within 5 days, we reserve the right to relist this vehicle or sell to any other qualified buyer. In order to secure bid on vehicle, Successful bidder (BUYER) must within 24 hours of bid closing send to Seller a Deposit in the amount of 10% by major credit card, cash in person or bank certified funds. Within 72 hours of bid closing, Buyer must send balance of funds by bank wire transfer, cash in person, bank certified funds to Seller. At time of sending initial deposit, Buyer MUST fax copy of their State issued valid Driver License. Furthermore, before said vehicle is released for shipment to Buyer, all other Sale related and title related paperwork must be signed and returned complete to Seller. Copyright © 2016 Auction123 - All rights reserved. - Disclaimer +- Auction123 (a service and listing/software company) and the Seller has done his/her best to disclose the equipment/condition of this vehicle/purchase. However, Auction123 disclaims any warranty as to the accuracy or to the working condition of the vehicle/equipment listed. The purchaser or prospective purchaser should verify with the Seller the accuracy of all the information listed within this ad. Selling a Vehicle? Create Professional Listings Fast and Easy. Click Here!